Article by Kevin Wilson of ERPGenie LLC - Optimizing your Supply Chain. 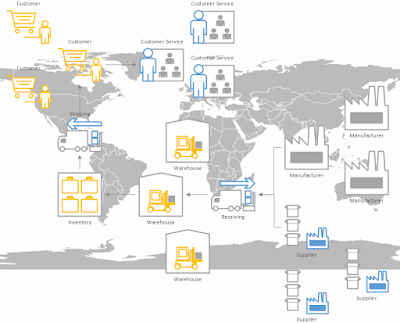 All exception events affecting the Supply Chain are received from all our partners. A reason for the exception is to be captured. Planned events are planned from a timing, location and partner perspective. E.g. We expect the delivery to be shipped at Warehouse ABC by Plant 1000 on 2/3/2017 @ 4pm. The execution of events (when and where they actually occur) are compared with their corresponding plan to determine if there was a discrepancy. Any discrepancies can lead to follow-on activities to take corrective action. Monitoring of the Supply Chain plan for events that have not yet occurred, when they should have occurred, can lead to follow-on activities to take corrective action. System messages that communicate the event to us are also planned for and need to be measured. E.g. The EDI X12 856 is the message that tells us a supplier has shipped the product to us (ASN). We would set a plan together to receive the ASN within 4 hours of the physical shipping of the goods, to ensure that we get the ASN prior to receipt of the goods. I.e. The goods are expected to ship at 2PM and we expect to receive the message at 6PM telling us that the goods have shipped.